Wow. This week has been a tough one to keep up with the Christmas Challenge. 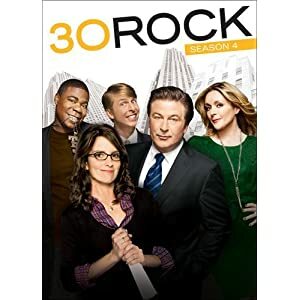 But I’m doing my best, and now, I have 30 Rock. 30 Rock actually has a number of Christmas episodes, but I let JC pick this one out for me. It has a good mix of everything Christmas: gift giving, Christmas carols, and the general outrageousness that is 30 Rock. While Jack’s interactions with long-time friend (and possible love interest) Nancy was entertaining (especially when they would mention U-Face), I’ll stick with the Christmas-related stories in this review. I can’t say I was all too overwhelmed with joy as the boys ganged up on Kenneth, claiming they were all followers of a fake religion. While I’m sure a lot of it had to do with its bitterness, it also just didn’t seem all that funny to me. On the other hand, I loved Pete attempting to get back at Jenna for not helping with crew presents this year by showing off the newest castmember and his fantastic voice. Of course, though, he’d become a softie and let her sing well, while he sang off-key and hideously. He’s just that nice of a guy. Meanwhile, Liz was trying to find the perfect gift for Jack that cost nothing. Considering how much Liz is the focus in a lot of episodes of the show, she really wasn’t in much here, just standing on the periphery as Jack worked on his relationship with Nancy. But in the end, she found the perfect gift: a bomb scare that kept Nancy in town for just a little while longer. Nice one, Liz. Recommendation: An entertaining episode, but probably not one that I’d recommend for annual viewing. Fun enough, though. Last night’s episode of 30 Rock was ridiculous. Now, it was funny, but it was ridiculous. Very, very ridiculous. The doctor. I don’t know why, but the idiocy of that man was the best. Sure, all his jokes seemed cliche. But just the fact that he wouldn’t fix the paperwork, insisted that he’d remember, and then proceeded to forget AND argue that he was right was fantastic. Plus, Alan Alda was in it again. So that’s always good. Anyway, I’m pretty sure this episode was just one of those moments when the writers behind the show teamed up to say, “How many guest stars do you think we can get to be in one episode?” And then they decided to test it out. And it worked. I loved the song (yay YouTube). And I loved Liz on the talk show. She sounded like she had such authority, and I was sure that it would turn on her. And it did. But it was still fun. I wish I had more to say, but the episode seemed to speak for itself. I enjoyed it, and the song’s great. So watch and enjoy (and comment on your own thoughts below). Well, since there was a large vast emptiness of nothing on last night (ok, I don’t watch Lost because I’m waiting to start it from the beginning and I’m not an Idol fan–and I did watch ANTM but I don’t write about it), I’ve got nothing to say here. Just kidding. I’ll write about what’s on TONIGHT! And there seems to be a lot. Seriously. If you don’t have TiVo, a DVR, a VCR, or an Internet connection, you’re in trouble. You might as well just shut off your electricity and read by candlelight because you’re just going to miss too much. No, that didn’t make sense, but there’s a hub-bub of activity fluttering in this Raked brain, and I don’t know where to start! How about at 8:00? Which will you watch? Bones? Smallville? I haven’t watched Smallville all season, but I’ll be certainly checking it out tonight. Why? Because two characters–maybe three–will be dying. Really dying. Not Heroes dying. Like, seriously, off-the-show dying. What’s your guess? I’m going to guess Tess and Doomsday but I’ve heard that both seem to have roles in the comic, so who knows? I would love for it to be Lana (hate her), but Chloe is always an option. It’d be a big deal if she died. But I love her. Keep her. Please? But you can’t just miss Bones after last week’s episode. I mean, it was huge! And I hear that Booth and Bones will be getting it on, too. People have been waiting for that for quite a while now. And I hear that it’s not what you think and the sexual tension will not be gone from the show (if it gets picked up–it’s on the bubble). So there you go. But what about 9:00? Nothing’s on then, right? WRONG! We have the two-hour finale of Grey’s Anatomy. What do you think? Will Izzie die? I personally think she won’t, but I’d love for her to just so I can get my Death Count back up again. I mean, no one has died since Heroes! And I made up a song and everything! Anyway, the big questions are whether Izzie will live and whether George will live. I know. Who even knew George was in danger? But I will be watching, as painful as it is. But don’t forget the finale and 100th episode of The Office, which comes with the return of Holly. As much as I can’t stand Holly and Michael, I’ll be watching. I mean, it’s The Office. For some reason, I must watch for the one occasional funny episode that’s left. 30 Rock also a finale. And if Alan Alda’s in it again, I certainly won’t miss it. I’m sure I missed some others, but these are the ones that I care about. Either because I like the show, or big characters might die. Is it sick of me to be watching just for that? If so, you’re sick, too. My dad’s a bigger critic of TV than I am, and even he was laughing at this episode. And you know, it really was funny. Ok, considering the relationship to Sheldon’s research, I can believe the Sheldon would have been invited on this expedition. However, I don’t see the university allowing him to bring his own team along–especially if someone had to drop out to get Sheldon in–and I certainly don’t think that the team would have included the three other guys of the show, especially when one has his Master’s in engineering. It makes no sense. And while it was a huge opportunity, I certainly wouldn’t be one jumping up and down to move to the North Pole for three months. I’d be in the boat with Raj and Howard’s mothers (hilarious interactions, by the way), and be saying no way. But it’s a TV show, and you can suspend reality. And that’s where we have the fun. I love that Sheldon is actually attempting to play pranks. He’s probably the best prankster of all of them just because he’s always so serious all the time, and the guys are afraid of crossing him (solely because he reacts so annoyingly). What about that Snuggie, though? Was anyone thrilled with the Leonard/Penny storyline? I mentioned in my post last week that the tension between the two has been so inconsistent that the recent buildup has been rather strange. I understand her being disappointed they’re all leaving. She’s losing four of her friends. And she may have some feelings left there, but they seemed overdramatized. But maybe that’s the best way they could fit some reaction to their leaving in there. Or was that Big Bang‘s attempt at a cliffhanger? I don’t know. I did enjoy, though, Penny’s reaction to Sheldon’s typical knock. Her knock back was HILARIOUS. Definitely one for the books. Anyway, overall, I liked the episode, despite this more-negative-than-anticipated review. It was just funny, and I think that’s what the finale needed to be. We’re not watching Ross and Rachel here. We’re watching a bunch of nerdy, geeky guys. Who needs the drama? Unless killer robots are involved. You can’t have those without drama. And fire. Fire helps. PS – Enjoyed Sheldon inventing the word Buzzingo (Bazingo? ), but it sounds a little too close to Elliot’s “Bajingo” in Scrubs. If you watch Scrubs, you know what I’m talking about.